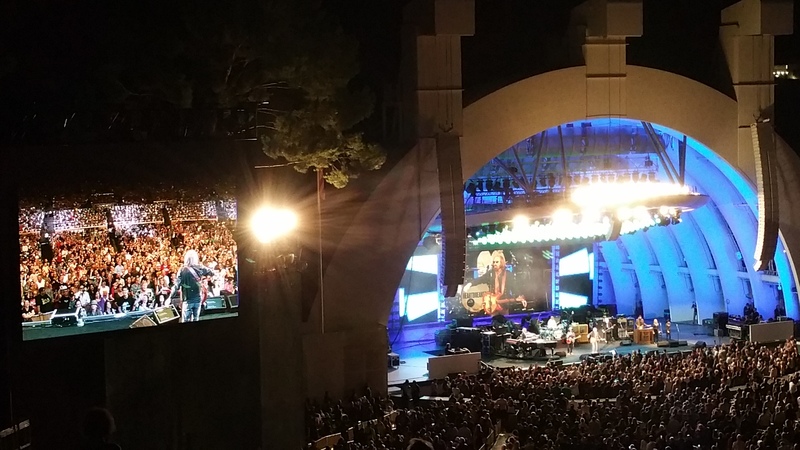 On the night of September 25, 2017, more than 17,000 music fans filed into the Hollywood Bowl for the last stop of the Tom Petty and the Heartbreakers 40th anniversary tour. The show culminated a third sold-out night at the Bowl and the group’s 53rd concert played around the US since April. None of us knew that it would be Tom Petty’s last show ever, but if we did, I don’t think anyone could have embraced it any more, including Petty himself. I’d heard from a friend who attended the Friday show a few nights prior that Petty went over his time and laughed about a $10K fine he would receive, and I only hoped he’d be willing to do the same on this final night. As it was, he wrapped before the 11pm cutoff with his classic finale “American Girl,” but I heard all my favorite songs (not just one, but handfuls), and marveled at the 66-year-old’s energy onstage. 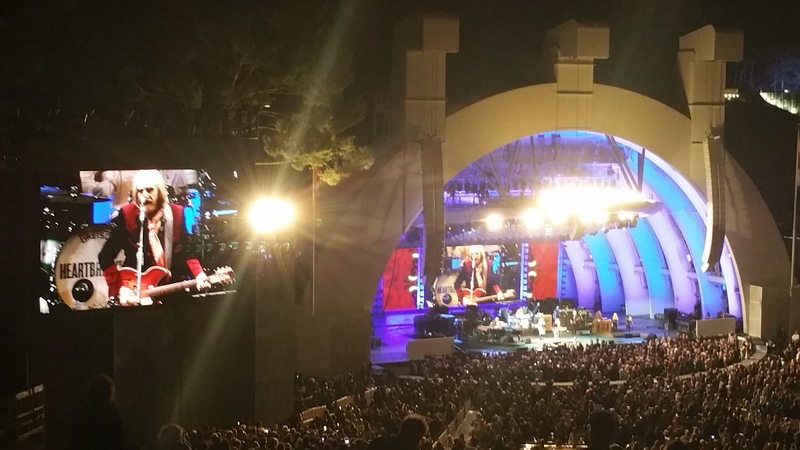 Tom Petty rockin’ the Bowl. The show began with “Rockin’ Around (With You),” the very first song from the band’s self-titled first album, released in 1976. Next, they launched quickly into “Mary Jane’s Last Dance,” which sent the crowd wild. Following my nose, I looked back over my shoulder in Section P3, where a twenty-something girl in a baseball hat and huge hoop earrings shared her joint with a middle-aged, big-haired woman. The woman took the most ecstatic, blissed-out hit, dancing with abandon in the spirit of a familiar, much-beloved song that for her may have evoked memories spanning decades. I didn’t need to partake to feel the vibe. Continuing the “Mary Jane” vibe, albeit with greater introspection, the band followed with “You Don’t Know How It Feels.” Next came “Forgotten Man,” released in 2014, a catchy song but one that didn’t draw quite the same crowd response as the old favorites. The fifth song was the irrepressible “I Won’t Back Down,” one of my personal favorites. Petty’s next song sent the crowd into a swaying, unified mass under a sea of lights from cellphones and lighters held high in the air. In his signature nasally voice, he drawled, “It’s an outdoor singalong kinda night… wanna have an outdoor singalong?” The band then launched into “Free Fallin’.” It seemed especially poignant hearing the song performed in Los Angeles, with the song’s references to Reseda, the Valley, Ventura Boulevard and Mulholland Drive. Under the vast umbrella of rock, Tom Petty has a song for any mood. Defiantly strong, wistful, expansive, exploratory, free, partying, reconciling, growing, striving and more were all captured just in one setlist, which was further rounded out with “Don’t Come Around Here No More,” “It’s Good to be King,” “Crawling Back to You,” “Wildflowers,” “Learning to Fly,” “Yer So Bad,” “Refugee,” and “Runnin’ Down a Dream,” among others. The evening imparted a rich breadth of resonant songs, satisfying versions of myself from my late teens, twenties, and current thirties. Music that for me and so many others, was an essential ingredient on the radio, road trips, jam sessions, and the overall experience of growing up. Music that soothes my soul, spanning a career with more years than I’ve been alive. Nothing of my experience as a fan is unique, but perhaps that’s the most special aspect – the sheer breadth, unity and raw joy his music spread, making the good times even better and the bad times bearable, elevating the masses. Tom Petty enthralling the capacity crowd. Exactly one week later, to my shock and that of the world over, Petty departed this earth. While he’d conceded that this would likely be the Heartbreakers’ last large tour, I never imagined it would be Tom Petty’s last show. I’ll comfort myself with countless songs, that just don’t get old. I admire the artist he was – genuine, relatable, driven. One who survived a heroin addiction, which not many people come back from.